CH’s Prof. John Pomeroy and Bob Sandford, together with James Bruce (a former assistant deputy minister at Environment Canada), have contributed an op-ed to the Globe and Mail outlining the increasingly parlous state of water quantity and quality in Canada. The article makes a strong case for establishing a federally-led strategy which would enable Canada to “join the rest of the developed world by measuring, forecasting and managing its water to promote our prosperity, environmental health and quality of life and to address threats posed by climate change”. The piece – published on 29th November 2015 – is available for online viewing here. CH’s Dr Cherie Westbrook was recently awarded second prize in the Society of Wetland Scientists‘ photographic competition, which attracted 136 entries. 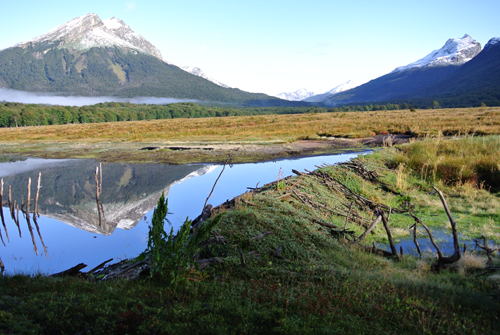 Her picture, Fens Under Water, shows a part of Tierra del Fuego National Park (Argentina), where invasive beaver have caused the wide scale destruction of many ecosystems. It is shown below, and has also been included in the 2016 SWS calendar, available here. The Tyee has published two articles by Ed Struzik covering opposite ends of the hydrological spectrum this week, both of which include contributions from CH director Dr John Pomeroy. The adventures of a group of six U. of S. students – including two CH alumni – during a trans-Canadian canoe odyssey in 2011 were covered in a recent article in the Regina Leader-Post: the piece is available online here. NSERC CREATE for Water Security is a research and training program for graduate students and postdoctoral fellows, which integrates natural, engineering and social science disciplines, and straddles the line between research and practice.